A slow and rocky start to the morning with happy thoughts of last night still too fresh in our minds. Of course we missed free breakfast but two slices of white toast hardly seems worth missing sleep over. We cleaned up in our private hostel and stored our bags in the luggage room in reception. Oh course it had started POURING outside. We said many times it's a very good thing we found the world's best bar the night before because Brussels really lacked in some "charm" areas. Ok so it's weather, what can you do? We headed out to find some breakfast/lunch. We walked all around the city in the cool old-timey part but found everything to cost somewhere between one arm and one leg. After 30 minutes of walking in the rain, being soaked we spotted a little sandwich shop called Frappies. More food heaven!! We split a smoked salmon veggie sandwich and a waffle dipped in belgium chocolate. 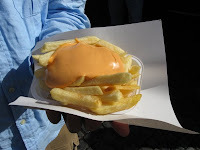 I have no idea what they do the the mayo in Belgium but it's amazing!! The smokey salmon flavor and crisp veggies on fresh baked whole grain bread is just what our bodies needed after a night of beer, beer, beer. We feel we could devote an entire blog section to the belgium waffle. Trust us, there is nothing even remotely close to this in the world. The crisp outer layer is made even more delicious with hard grains of caramelized sugars. Don't even think it might be dry! The chocolate was unworldy!! Why someone hasn't had the brilliant idea to bring the real waffles over to the states is beyond us. There is just nothing better and a million ways to eat them. Ok enough about the waffle. We collected our bags and attempted to wait out the rain. Finally we just packed up and walked the mile to the train station. This train ride was a breeze compared the last. Only and hour from Brussels to the sleepy little town of Bruges. When walking into town there is an eery silence, like you are honestly stepping back in time to the middle ages. We walked a good 1/2 mile before we saw signs of life on the cobble stone streets. This is what Europe is about, a town that looks nearly unchanged in hundreds and hundreds of years. With a great map in hand we found our hostel very quickly. One great thing about Bruges is it's a walking town, no need for buses ever. Any place you want to go is never more than a 10 minute walk. 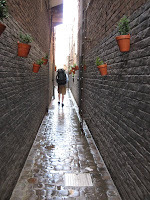 We walked down an ally then between two building to get to the back door of our hostel/restaurant. We explored the town taking pictures everywhere we went. Bruges is a canal city and called the Venice of the north, truly beautiful. First stop: try the famous Belgium fries! We split a small with "cocktail sauce" which is ketchup/mayo/whiskey.... yum they were outstanding. There are two famous fry businesses next to each other that compete to be named the best. We'll try the other in the morning and get back to you. Next on to a church, it's been a few days. 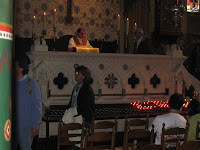 We went to the famous Holy Blood Chapel. . Everyday this shiny vial is taken out of its safe and put on a pillow to be worshiped. we got a first hand look at it up close, quite exciting! The little cylinder was taken on a crusade to Jerusalem in the 12th century, and true catholics believe it's full of Jesus blood. We had a big mission for this trip. Find the most rare and number one best beer in the world. It's made by Trappist monks and you can only get it by calling ahead to the "beer hotline" where if you are very very lucky you can set a date to come and buy one case. The beer is so rare that on the black market it goes anywhere from $30 a bottle and up. But selling it for profit is very very frowned on by the monks who only make this beer to "support being monks." So this adventure was going to be a day trip out of Bruges and probably going to leave us coming up empty handed. As luck would have it we wondered into an amazing store and started talking to the shop keeper about the process of getting the beer and his thoughts. Low and behold he happened to have some!!!! We paid for 3 bottles. One for each of us and one for Jon back in Minnesota. 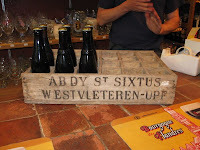 After showing us the old wood crates the monks still use to deliver beer and taking a bunch of pictures we were set. The shop keeper was so kind and helpful (like almost everyone we've run into) and provided wrapping for the bottle of beer and a safe way to ship the bottle to the US. We walked out of there Heather carrying the bottled boxed up and Charlie carrying the two beers in a small backpack. We walked like we were holding new born babies. Our hands were nearly shaking. One short trip to the post office and off goes our little treasure. So we have our two beers hidden in our bags trying to find a way to get them cold and enjoy them. Perhaps we could wait to drink them till we are in Naples and eat the world's best pizza (we have a lead on that too). With our shiny free map we got a great lead on spaghetti for 3 euros each. We thought this was too good to be true. Good night... where are these small european portions we've heard so much about?? The woman who took our order asked " can I put cheese on it." Heather had to bite her tongue not to say, "is the pope catholic?" HUGE meals, HUGE!! Wonderful sauce, fresh herbs, meat and nearly 1/2 a pound of cheese on each. Yum! Walking was a good idea after that for at least an hour to keep us from going into a food coma. Mostly we've been sharing small meals to save money so eating something so huge was a lot to handle. We toured the Crown Plaza basement because it's: cool and free. Basically it's a huge hotel that was built on top of a church but the foundation was keep the same. And because there was going to be some sort of reception there a big tray of Belgium chocolate was laid out.... yes Heather grabbed a handful and ran. This chocolate was amazing, it was like nothing before. The taste was closer to eating a rich moist piece of cake that melted away. Heaven. One of the best chocolate tips is to buy the chocolate at the market it's the same stuff as in the really fancy shops but not in cute shapes. A lot of the time on our trip is spent trying to find free wifi. This town has really been a challenge. We kept being directed to internet cafes.... as if we would PAY to use the internet!?! We saw some of the funny little sites like a cannon that is in the middle of a sidewalk upside down, no one knows the story but it's been that way for hundreds of years. We were too late to see Michaelgelo's Madonna, perhaps in the morning before we head to Paris. What city would be complete without a trip to an icecream shop. With so many flavors in a language we don't speak it was hard to decide. The shop girl was very nice and gave us a lot of samples. Charlie had some really tasty berry sorbet and Heather had.... well she had no idea but it was yellow with a pink swirl here and there. One more stop back at the hostel to grab some warmer clothes then out to drink our one beer in Bruges. The last night really caught up with us and we are short on sleep so we called it an early night. No internet here tonight, we are in a very cute hostel with a German guy who needs to put on some pants.... and quit talking to himself about mosquitos. 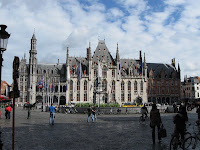 We LOVE Bruges, a midevil town with a heart of gold. We both feel our mom's would love it here... perhaps they will come with us next time. You guys are having an amazing time!!! What memories you will have. All is well with us. Penelope is doing great... She and Dylan are great friends. He won't go anywhere without her. Charlie, remember you are part Dane. Grandpa S. would be proud! Can't wait to see your newest pics. Hope your livers survive the adventure. Looking forward to Paris in the Fall pictures and comments. Jets (Favre) vs Giants - to be played out! Still waiting for the "Gay Paris" blog - imagine I said that with a French accent!! He says that he loves you and he will sign up for Google when Jan gets back from Las Vegas. Godfather Paul is checking the blog daily!!! He says, "Don't do anything I wouldn't do!!" P.S. That scares me and Paul says HI to the pope when you get there!! small little town with not too many people.. quiet.. geez sounds like Brigadoon not Bruges!!! You guys do such an amazing job writing all of this.. the way you describe food makes me soo hungry! Amsterdam Day 4.....or is it Heinekenville??? London - Galleries, Museums and puppets... Oh My!